Why read and reflect with Joan Chittister on the sacred writings of other religious traditions? Why spend time together with Buddhist, Hindu, Islamic, Jewish, Native American, and Christian texts? Why? Because your God can become bigger, and you, as well. 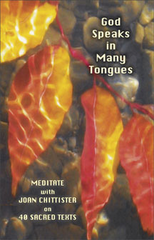 Because you can find that God speaks in many tongues, glows in many colors and calls to us in many voices. Because you may find new ways to see God and new ways to God. * invites you to join her in lectio, reflective reading of the text.